When it comes to binary options trading, IQ Option is a well-known and established broker. With a solid options trading platform and other essential features, IQ gives you the best opportunity to stay ahead of the pack. Continue reading to find out what binary options are, how to trade it with IQ Option, and which features you can enjoy with this broker. Binary Options are only available to non-EU clients and certain EU clients who have professional accounts with IQ Option. or is multiplied by a certain profit factor in the case of a winning trade. Whether the price is likely to rise or fall. When to enter the trade.The strike price (price at which to enter the trade). How much to invest in the trade. The expiration time of the option. Expiration time: 5 minutes after the option contract is entered. Payout: 90% of the invested amount. A call option is bought by a trader who expects the price of the EUR/USD to rise and be above 1.16500 (the strike price) at the time when the option expires. An investment of $10 is made in this trade. If the price is at 1.16500 when the option expires, the trader will neither lose his investment of $10 or gain anything, because the price at the time of expiration is the same as the strike price. If the price trades above 1.16500 when the expiration time is reached, the trader will gain 90% ($9) on top of the amount ($10) he invested. So when the option expires, the trader will still have his initial investment of $10 plus an extra $9, which means he has made a profit of $9. If the price trades below 1.16500 when the expiration time is reached, the trader will lose his initial investment of $10. The trader may, for whatever reason, choose to exit the options trade prematurely. This will limit his profit potential on the particular trade, as the payout (in case a profit is realized) at that time will be less than the maximum payout which may be achieved in case the price is above the strike price at the time of expiration. 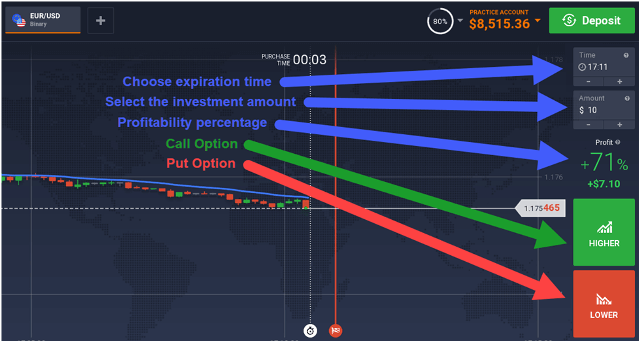 Of course, in the case that a premature exit from a binary option results in a loss, the loss may in certain cases be less than the maximum loss which could be incurred if the option expired out of the money (below the strike price). 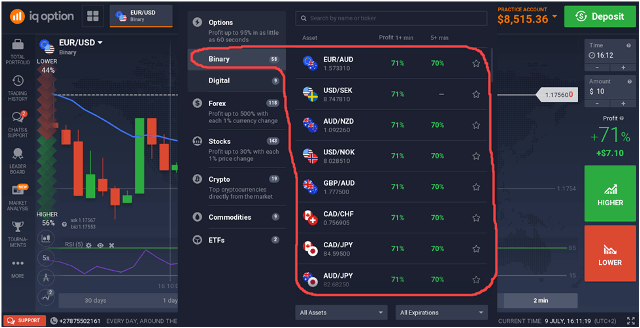 Now that we’ve covered some basics of trading binary options, let’s look at how to trade it with IQ Option, specifically. 3. From the list of binary options, open charts for those instruments you want to trade. The profitability percentage is the percentage of the invested amount which will be credited to your account for a successful trade. 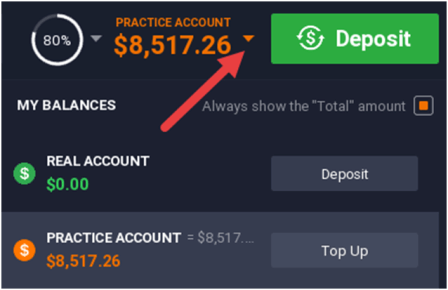 The percentage in this screenshot is *71%, which means that a trader who invests $10 in a successful trade will retain this $10 and gain an additional $7.10 as soon as the binary option expires. If the trader loses the trade, he will lose the $10 he invested. *Amount to be credited to the account for a successful trade. With IQ Option, clients can trade binary options from the following asset classes: forex (about 34 pairs), stocks and stock indices (about 24), and commodities (gold and silver). Traders can also enjoy weekend trading with OTC (over the counter) binary options which are available when the markets for regular binary options are closed. Only a few forex pairs are available to trade with OTC binary options. 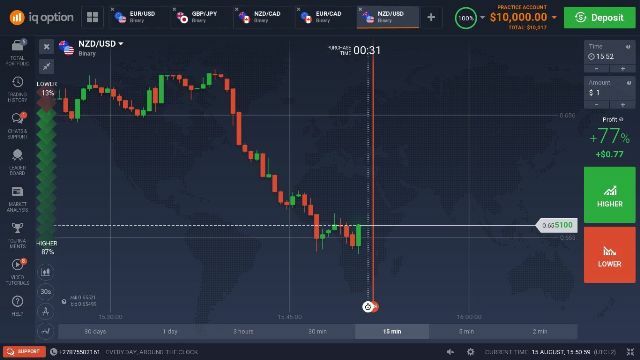 The minimum deposit at IQ Option is $10 and the minimum deal size is $1. The payout percentages of the different binary options vary, depending on the time of the day, the expiration time, the spread and transaction costs of the underlying instrument, the instrument’s liquidity (which may also impact it’s spread), and some other factors. The maximum payout percentage (on certain instruments) is about 90% to 95%, but this may vary from time to time. Although IQ Option offers numerous other tradable instruments besides different option contracts, it is actually well-known for offering excellent infrastructure for trading options, including binary options, of course. Technical analysis on different trading instruments can be done accurately and efficiently with IQ Option’s charting package. 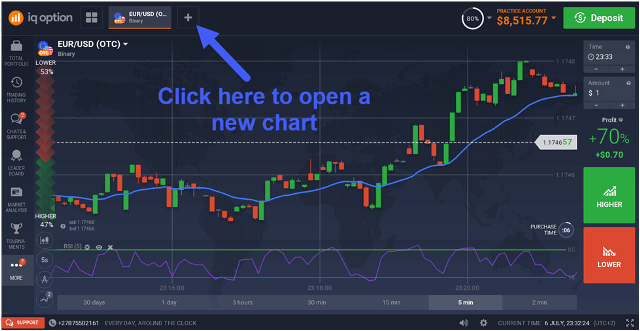 Whether you like to use moving averages, oscillators, or even Ichimoku Cloud, these indicators (and many others) are freely available in the trading platform itself. 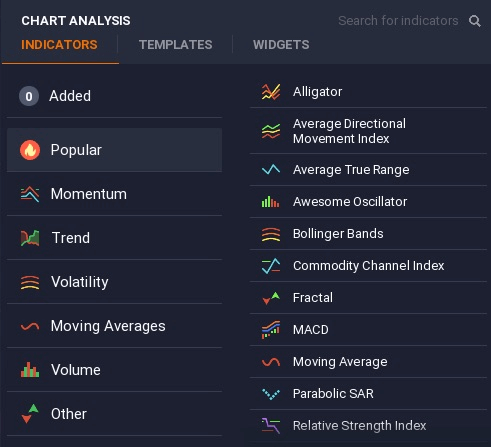 A FEW OF THE INDICATORS AVAILABLE IN IQ OPTION’S TRADING PLATFORM. Total Portfolio (Here you can see a list of all your open positions). Chats and Support (Chat with fellow traders or IQ Option support representatives). Market Analysis (Get live news and market updates here). Tournaments (Get information about IQ Option’s trading tournaments here). Video Tutorials (Learn more about the markets here). Help (Ask a question or view frequently asked questions in this section). With IQ Option’s trading platform, traders can trade binary options (and other instruments) directly on the charts they’re looking at. There is no need to open a separate order entry box or anything like that. This makes trade execution really convenient. Traders can also choose between different chart types (for example candlestick charts, Heikin-Ashi charts, line charts, bar charts, etc. ), apply different timeframes, and use graphical tools to draw lines and other features on their charts. Traders who would like to specifically trade binary options, on mobile devices, can only do it with Android devices, after downloading IQ Option’s Android app from its website. Google Play and the App Store do not have apps available for trading binary options with IQ Option. TAP ON THE ARROW NEXT TO THE ACCOUNT BALANCE TO SWITCH BETWEEN LIVE AND DEMO ACCOUNTS. IQ Option makes trading tournaments available to non-EU clients and certain EU clients who have pro trading accounts with IQ Option. With each tournament, only binary options can be traded. Each participant gets a tournament trading account with a virtual balance of, for example, $100; with an entry fee of $20 (also just an example). The initial virtual account balance, entry fee, prize pool and structure, and duration of the tournament vary. Participants compete for a prize pool which is divided between the top traders (usually between 1 and 30) with the most money in their tournament accounts at the end of the tournament. Contestants can open binary option trades with any portion of the available funds in their tournament accounts. They can also use the ‘rebuy’ tool which allows them to top up their virtual tournament trading accounts with the value of the initial balance in case the balance falls below the value of the initial balance. This rebuy tool can be used an unlimited number of times during each tournament but each rebuy will cost the same amount as the initial entry fee. IQ Option’s support team is on standby to assist clients 24 hours a day, 7 days a week, via live chat, telephone, or email. It shouldn’t be surprising that IQ Option has received quite a number of awards. These have been awarded to IQ Option for its outstanding trading apps, its commitment to quality and excellence, its efficiency, impeccable design, and other attributes. Although IQ Option offers much more than just binary options, many of its awards have been for services and infrastructure related to binary options. 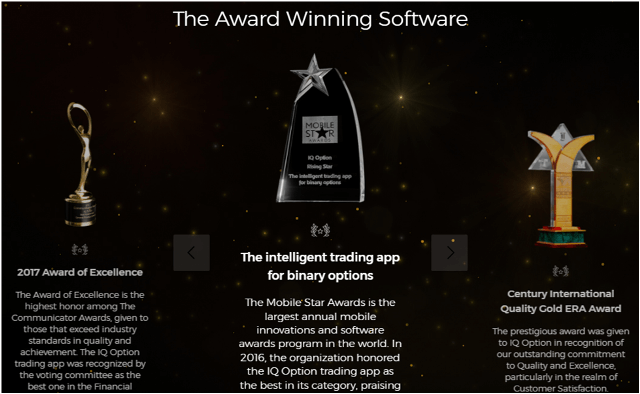 IQ OPTION HAS OFTEN RECEIVED AWARDS FOR ITS TRADING APPS, CUSTOMER SATISFACTION, AND OTHER GOOD ATTRIBUTES. IQ Option is a solid broker with good trading apps, especially for trading binary options. It offers a wide range of binary option assets and also has digital options, forex pairs, stock CFDs, commodity CFDs, cryptocurrency CFDs, and ETFs available. IQ Option’s trading app (desktop, online, or mobile) is equipped with all the tools that a trader may need, and to execute trades with this user-oriented app is a pleasure.